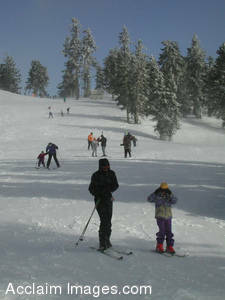 Description: Stock Photo of Skiers on a Slope at the Mount Ashland Resort. Family and friends sking together at the Mt Asland ski slopes.A typical weekend sport here in the winter time in Southern Oregon. This image is available for licensing as stock photography or can be purchased as a poster or as an art print.